Effective August 20, 2018, the University’s parking enforcement hours will be 7-days a week, 8:00 a.m. to 11:00 p.m. All vehicles must park head-in only, and have the license plate registered with the university. Campus visitors should follow the instructions provided by the school, department, venue, or event organizer. Alternatively, the following options are available. Daytime Campus Visitors (M-F, 8:00 a.m. to 4:00 p.m.): Visitor’s metered spaces are located at the following locations on a first-come-first-served basis: Pavia and Merrick Garages, Memorial Drive (by Richter Library), the Yellow, Gray and Burgundy color zones. These locations use PayByPhone for payment, and on-foot pay stations are available in the general area – visitor’s parking map. The parking session is limited to the posted parking location number; if the vehicle is moved between the Pavia and Merrick Garages, the Yellow, Gray, or Burgundy color zones, a new parking session must be initiated per color zone. Using PayByPhone or the on-foot pay stations, automatically registers the vehicle’s license plate with the university. Nights and Weekend Visitors (M-F, 4:00 p.m. – 11:00 p.m., and Weekends 8:00 a.m. – 11:00 p.m.): During these hours, all parking lots and garages are PayByPhone capable to facilitate parking payment, and on-foot pay stations are available in the general areas – visitor’s parking map. The parking session is valid in any color zone, and it is not limited to the posted location number. For example, a three-hour parking session initiated in the Red color zone allows for the vehicle to be moved between color zones within the three-hour parking session. Using PayByPhone or the on-foot pay stations, automatically registers the vehicle’s license plate with the university. Parking Cost: PayByPhone is $1.50/hourly, plus .27 cents transaction fee. Parking session of 5-hours or more converts to all day parking at $8 plus .27 cents transaction fee. On-foot pay station is $1.50/hourly; no transaction fee. All vehicles, including those with handicap placards/disabled parking permits, must pay for parking. 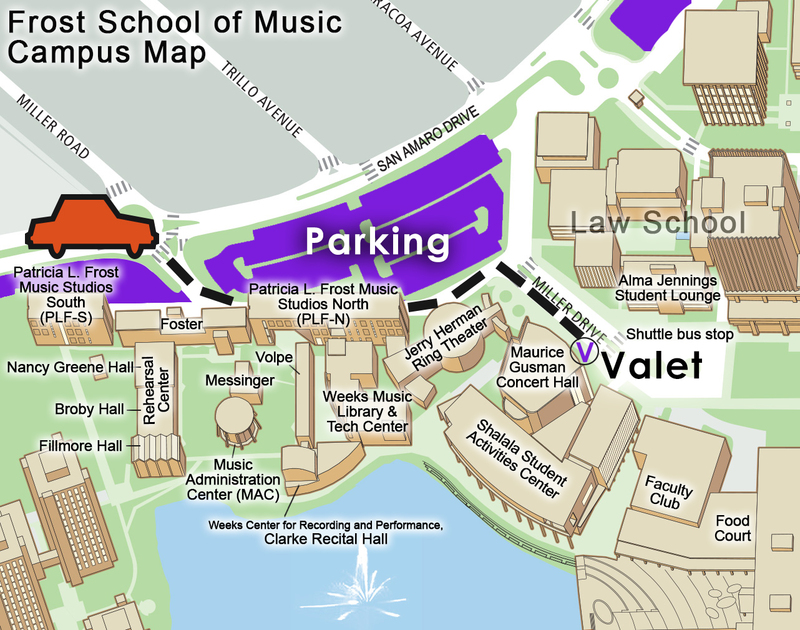 Patrons with a handicap placard/disabled parking permit can obtain free parking via valet only. Monday through Friday: 6 p.m. to 10 p.m. Valet attendant leaves at 11 p.m.; no overnight parking.